This memo was presented part of a workshop organised by the LSE Middle East Centre and the RAND Corporation looking at Russia’s strategy in the Middle East on 28 March 2018. Over the last few years, Russia’s foreign policy objectives have appeared twofold: first, President Putin wants to re-assert Russia’s role on the global stage, if possible on par with the US. Second, Russia is keen to prevent countries that it sees as belonging to its sphere of influence (mainly countries that were part of the former Soviet Union) from joining Western institutions such as the EU or NATO. As of early 2018, President Putin seems to have succeeded in achieving both goals. Russia’s international influence has steadily increased in recent years, as the country’s involvement in Syria – and more generally at the UN – illustrates; in addition, Ukraine will not be able to join the EU or NATO for many years to come owing to its conflict with Russian-backed rebels in the Donbas region. In this context, Russia’s increasing presence in the GCC, Iraq, Jordan and Egypt has been making the headlines in recent months. There, Russia seeks to use the vacuum left by the US to fulfil the objective of increasing its global influence. It also capitalises on popular disenchantment with controversial US policies, such as relocating the US embassy from Tel Aviv to Jerusalem, and brands itself as a reliable, alternative power to the US. For their part, these Middle Eastern countries view their relationship with Russia as useful leverage in their dealings with the US. Over the last few years, the Russian Direct Investment Fund (RDIF) has concluded several agreements with GCC sovereign wealth funds. These agreements aim to increase the long-term presence of GCC sovereign wealth funds in Russia through investments in the infrastructure and energy sectors. International financial sanctions that the US and the EU started to impose in 2014 restrict the ability of Russian companies to raise debt in Western capital markets; such agreements therefore provide Russia with a potential alternative to finance its infrastructure projects. However, and with the exception of Qatar Investment Authority (QIA), which owns a small part of Rosneft, Russia’s state-owned oil company, and has a stake in St Petersburg’s international airport, the implementation of these agreements has disappointed. In a context of lower global oil prices, GCC sovereign wealth funds have less capital to invest in Russia, a country that they perceive as particularly risky; meanwhile, the Russian government remains cautious about increasing the long-term economic footprint of traditional US allies on its soil. The one area, however, where Russia has fulfilled its hopes in the Middle East is the business arena. 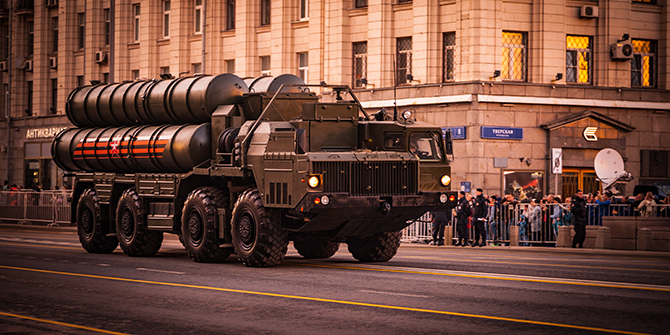 In line with its global strategy, Russia is concluding deals in three strategic business sectors: oil and gas (through operations conducted by state-owned monopolies Rosneft and Gazprom, as seen recently in Iraq); military equipment, such as the S‑400 air defence missile systems (which Russia is in negotiations to sell to Saudi Arabia and Qatar – both key US allies); and nuclear power plants (through long-term deals concluded by Rosatom, the state-owned nuclear company, as has been the case in recent years in Egypt and Jordan). In this regard, the nuclear sector appears to be especially important for Russia, as nuclear deals come with a long-term training component in Russia for local engineers and nuclear sector employees. By providing these trainings, Russia buys long-term influence in the Middle East: Egyptian and Jordanian nuclear engineers will promote Russian technology at home once they complete their education programme in Russia. The beauty of this strategy, focused on single trade and investment deals, is that it comes with no strings attached for Russia. Contrary to the US and Western countries, which have several military bases in the region and have cultivated their long-term presence in the region, Russia could withdraw quickly should its foreign policy interests change. In such a volatile global environment, Russia’s short-term, agile strategy therefore appears to be a winning one: Russia’s state-owned companies benefit from strategic business deals and the Russian state is stepping up its presence on the global stage, in line with its foreign policy objectives. Yet at the same time, and by avoiding any long-term commitment in the region, President Putin is also following the advice of former Israeli Prime Minister Ariel Sharon: do not trust anyone in the Middle East. Agathe Demarais is Regional Manager for Europe at The Economist Intelligence Unit (The EIU). She is an analyst for France, Russia and Ukraine, with a keen eye for Middle East affairs. Prior to joining The EIU, Agathe worked in the diplomatic corps of the French Treasury in Moscow and Beirut, where she covered Egypt, the Levant, Iran, Iraq and the Gulf for economic and financial affairs. She tweets at @AgatheDemarais.